Since the alien invasion that turned Manhattan into a war zone, Tony Stark has been hard at work upgrading his Iron Man armor. His latest suit is a technological masterpiece, separated into individual components and able to assemble with a thought. 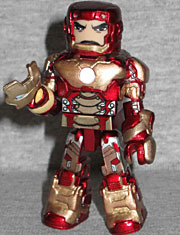 The Iron Man 3 Minimates are divided between Toys Я Us and the specialty market: two sets are exclusive to TRU, two are exclusive to specialty stores, and two are available everywhere. That's pretty average for the way these things work, but this time Art Asylum did something weird: the Mark 42 Iron Man at TRU is red and yellow, while the Mark 42 Iron Man at comicshops is red and gold. They're identical otherwise, so what's the story on that? Whichever color he is, the figure is given some very complex paint apps, red and goldyellow and silver, and fine black outlines separating them. He has a solid helmet, a helmet with a removable faceplate, and a piece of black hair. The boots, gloves, upper arms and chest cap are new molds, which does present a bit of a problem: the chest cap sticks out far enough that the squarish shoulders on the new upper arms can't move past it without popping off. Who is the Mandarin? Where does he come from? What are the Ten Rings? His objective seems to be chaos, throwing the world into disarray by targeting innocents. And When Iron Man gets too close, the Mandarin will strike at the people he cares about. Some fans got upset by the way IM3 handled the Mandarin, but the idea of a mass market terrorist delivering his threats via social-media-friendly snippets? That's pretty damn clever. The figure wears an ornate green and gold cloak over a fancy shirt and belt, brown pants, and army boots. He gets new forearms to create his sleeves, and his hands are molded with five rings apiece. Since the rings weren't magical, he's also armed with a gun. 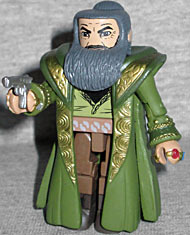 Ben Kingsley did a great job playing the Mandarin, and this Minimate does just as good a job of re-creating his look. His dark grey hair is pulled up into a bun on the crown of his head, and his long beard falls down over his chest. For some reason, he also includes a second hair piece without the beard. I guess so you can turn his head? No idea.